International Journal of Research in Health Sciences,2014,2,3,943-945. Department of Obstetricsand Gynaecology, Mamata General Hospital, Khammam, Telangana, INDIA. Rudimentary horn is one of the rare mullerian congenital anomalies and consists of a relatively normal appearing uterus on one side with rudimentary horn on the other side. In our case 17 years old primigravida with amenorrhoea of 52 days has reported with abdominal pain. 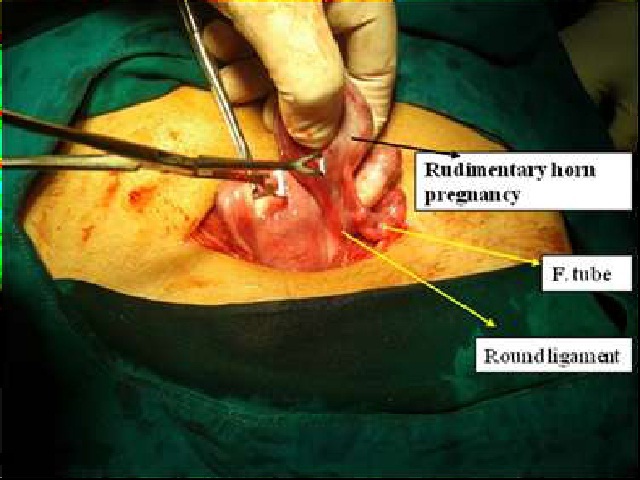 Early diagnosis of ectopic pregnancy was done with Transvaginal sonography. Intraoperatively unicornuate uterus with pregnancy in rudimentary horn on left side was found. Excision of the horn was done. Same side tube was healthy and conserved for future tubal reconstructive surgery.